Our talented designers have provided a gallery full of bridal emoji shirts that are ready for you to customize!! Use the coupon code below to save! Use coupon code BPTJ8 at checkout and get 8% off orders of $40.00 or more! Offer expires 7/31/2015 at 11:59PM EST. 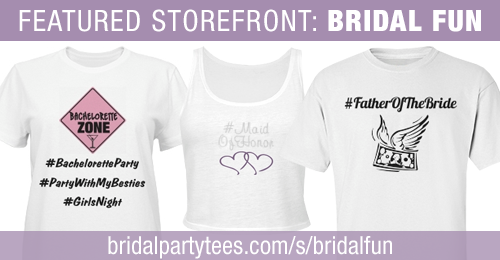 It’s that time of month again where Bridal Party Tees names their storefront of the month. This month’s feature highlights Bridal Fun’s designs for today’s brides and their wedding parties. Bridal Fun offers simple, clean but trendy bridal party designs that include hashtags and rhinestones. Another great factor about Bridal Fun is that they are price conscious to their customers by placing the majority of their designs on sale items. 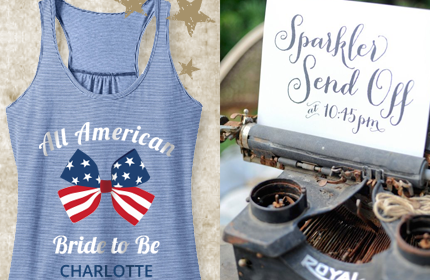 While Bridal Fun’s designs are simply amazing on their own, you can take any design and make it your own by changing the art, font, and text. Our easy to use design center allows the customer to be their own designer and be as creative as they want. The option is up to you to make your designs cute, funny, or traditional. 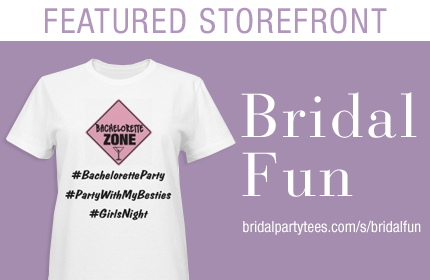 You will be sure to make your bachelorette party or wedding extra memorable with Bridal Fun’s custom apparel! At Bridal Party Tees not only do we like to stay on top of the trends but be trendsetters. We offer the most fashionable custom apparel and the newest designs in bridal apparel. If you haven’t heard emojis are all the rage and taking over the custom apparel world. 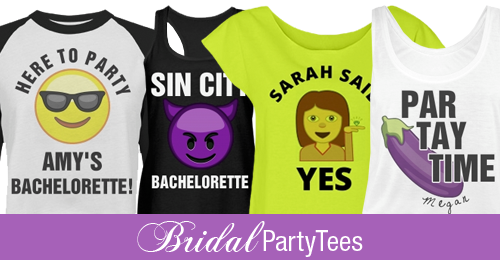 We jumped on the opportunity to bring you a gallery full of bridal emoji shirts that are ready for you to customize! For those of you who don’t know, an emoji is a small digital image or icon used to express an idea or emotion in electronic communication. Devils, cats, eggplants – we’ve got them all. Of course we added our Bridal Party Tee’s touch by incorporating essential wedding and bachelorette party accessories like veils, feather boas, and tiaras. Each design can be customized to include names, dates, and locations. You can even create matching hats, bags, and koozies to go with your shirt designs! There are no other wedding and bachelorette party shirts like this available so make sure you jump on this craze and be the first to show off your trendy style as the future Mrs! 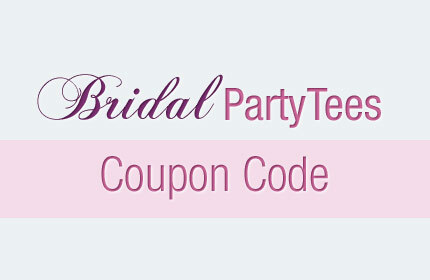 Check out our new bridal flannel shirts and use the coupon code below to save! Use coupon code BPTJUN at checkout and get $3.00 off orders of $30.00 or more! Offer expires 6/30/2015 at 11:59PM EST.